Marijuana is the name for the entire “bud” which is harvested from the cannabis sativa plant. Though “cannabis” and “marijuana” are used interchangeably, marijuana refers to the parts of the plant used for consumption, while cannabis is the technical term for the name of the plant. Primarily, is is the bud of the cannabis plant, the “nugget” looking collection of leaves, which is used for consumption. The stems and flowers can also be used. Marijuana is used recreationally to achieve a “high” of euphoria or a “stoned” state. It is the activation of THC, the psychoactive ingredient in marijuana, which causes the interaction in the brain to cause getting “high” or “stoned”. Recreational use of marijuana is most commonly done by smoking it, either as a cigarette, a cigar, or through glass paraphernalia. THC can be strained from the marijuana and used for culinary purposes. Creating food substances with marijuana is a common form of consumption for medical marijuana, which is another use. Medical marijuana has been researched heavily and legalized in many different states around the country. Proposed as an effective treatment for cancer, autism, chronic pain, ADD/ADHD and other conditions, most recently including opioid addiction. The federal government has not legalized or condoned medical marijuana. The psychoactive ingredient THC, tetrahydrocannabinol, and other chemicals in marijuana produce cannabinoids and other neurotransmitters in the brain. Blocking naturally occurring cannabinoid receptors in the brain, marijuana creates a feeling of intoxication. Marijuana can cause a chemical dependency over time, creating a tolerance in the brain which requires more volume of marijuana be consumed more often. Higher amounts of marijuana have a changing effect. Many people first experiencing marijuana experience gleefulness and uncontrollable laughter. Increasingly, there are experiences of paranoia and anxiety. Effects of marijuana can range from relaxation to stress, pain-relief to pain-sensitivity, hallucinations to feeling mindless, and more. Physically, marijuana tends to create either a feeling of weightlessness and floating or feeling heavy and unable to move. Marijuana is known to induce high levels of hunger, called “munchies”. Other physical effects can include sweating, shaking, red eyes, and more. 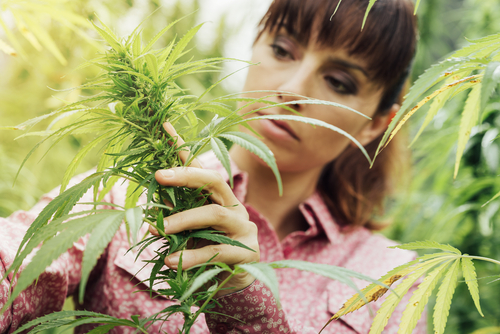 Marijuana addiction is a legitimate substance use disorder which can be debilitating. However, due to the normalization of marijuana and the stigma of addiction, many aren’t willing to seek treatment. If you or a loved one are in need of treatment for marijuana addiction, Hired Power can help you plan every step of the journey. For information on our empowering recovery services, call us today at 800-910-9299.